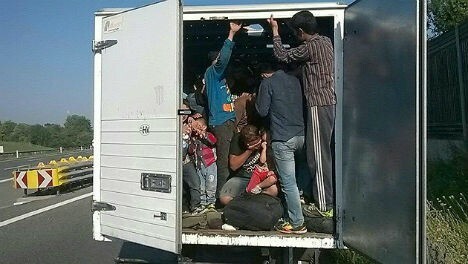 Over 125 migrants were found stranded this weekend on motorways in Austria, with at least a dozen children among them, police said on Sunday.Eighty-six people squeezed into the back of a lorry — including 16 children — were discovered by police on Saturday abandoned on an Austrian motorway in temperatures of 35C. Several others had also taken ill, according to public broadcaster ORF, with the migrants forced to make holes in the lorry’s sides so they could breathe. The lorry’s driver abandoned the vehicle before police arrived. Police spokesman Johann Baumschlager said that it was “by far the worst case of smuggling” the Lower Austrian police force had seen and that even experienced officers were shocked. The Red Cross provided the exhausted migrants with drinks and a meal of pasta.